Bhutan has a very rich species of flora ranging from altitudes as low as 200m to as high as 4000m. Over 5500 species of vascular plants have been recorded till date including 46 species of Rhododendrons and 369 species of Orchids. The Bhutan Himalayas is also important source of valuable medicinal plants used in ayurvedic medicine so much so that a National Institute of Traditional Medicine has been established at Thimphu. 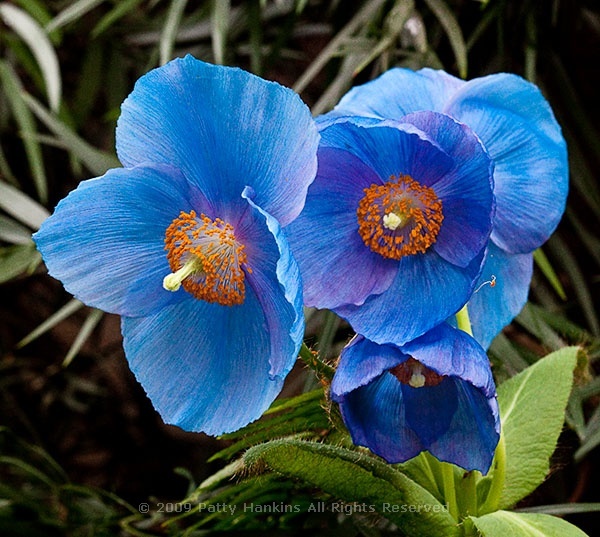 Botanical name of the flower Meconopsis grandis Prain and the name is Blue Poppy. It is callted Euitphel Metog Hoem in national language of Bhutan. At one time, people considered it to be a myth because of its existence had not been confirmed but they can be found along high mountain passes from the far eastern parts of the country across to the west. It is one of the rarest flowers in the world and its stems have 4 to 5 flowers. Flowering season is Late May to July. Flowers usually few, rich blue or purple, borne on long stalks from the uppermost leaves, or sometimes arising directly from the basal rosette of leaves. 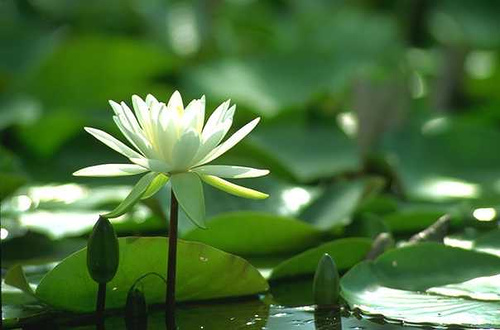 Flowers large, with commonly 4 rounded petals (sometimes as many as 9) upto 7cm in size; Stamen filament whitish. Leaves stalked, the stalk sheathing at base, with oblancoelate to oblong elliptic coarsely toothed blade 10-30 cm, covered in rufous bristles; Uppermost leaves in a false whorl from which the flowers arise. Capsule ellipsoid – oblong to 5cm. 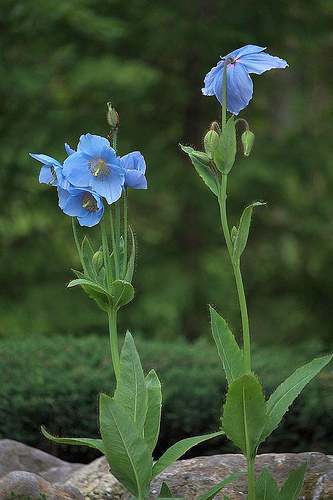 Blue poppies, the national flower, that once grew in abundance at paro has been severely depleted in recent years. The society feels that the depletion is because of plundering by people from neighbouring districts with particular interest in gardening. Small holes left in the flowering area indicated that people had been digging up these plants according to the society. The society fears that this species might be wiped out totally from Chelela. However, no research has been done and the society does not know the implications it might have on the ecosystem.